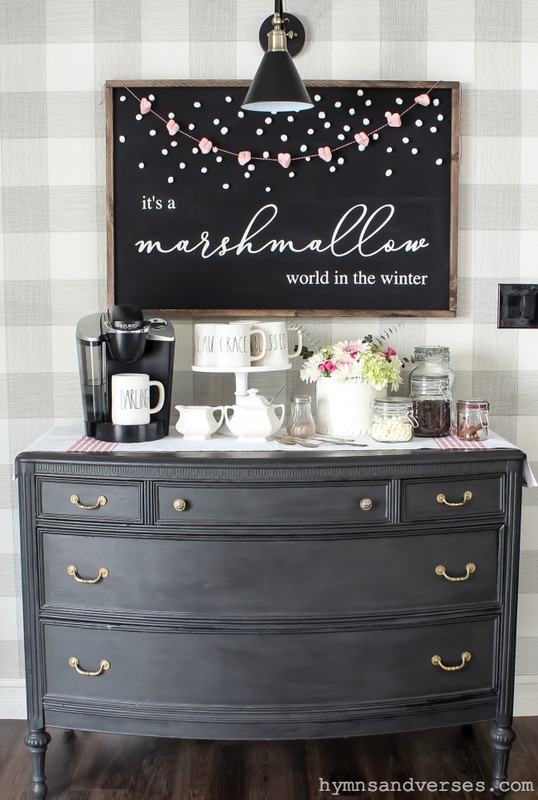 We finally are having a snow day here today and to celebrate, I thought I’d share a little hot cocoa station based on a song that is heard mostly at Christmastime, “It’s a Marshmallow World in the Winter”. When it snows, this is the song that pops into my head! It’s an oldie for sure, but isn’t everything old new again! The version of this song that I remember was sung by Dean Martin, who was part of the rat pack with Frank Sinatra in the 1960’s. My mother loved these crooners, so I heard their songs often when I was young. 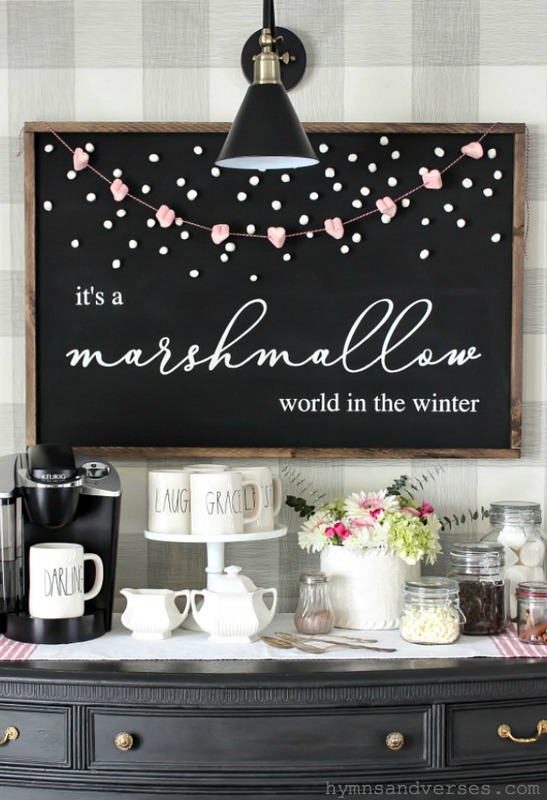 The main feature is the sign that I made using the song title, “It’s a Marshmallow World in the Winter”. I kept the words to the lower half of the sign and glued mini marshmallows to the top half of the sign to represent snow falling! The pink and white heart marshmallows are from Target. I used a large upholstery needle with red and white baker’s twine to string these marshmallows to drape across the top of the sign. Its a fun touch for the upcoming Valentine’s Day holiday! 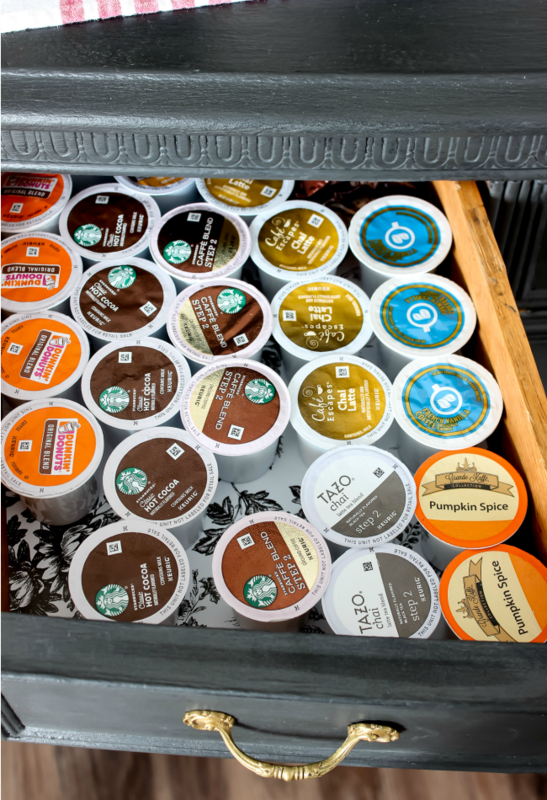 I moved my Keurig K cups to the top left drawer of the dresser so they would be easily accessible to make hot cocoa, coffee, or tea. 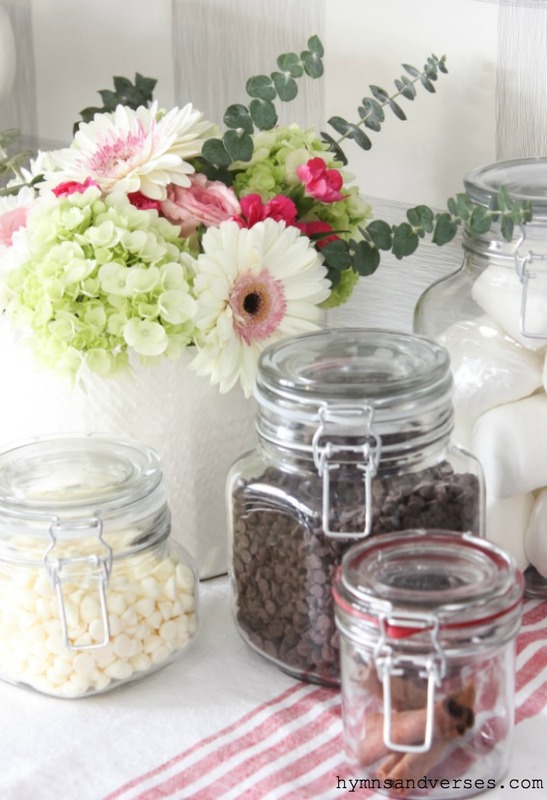 The white cake stand holds a few of my Rae Dunn mugs and that provided more space for a vintage ironstone sugar and creamer, vintage spoons, flowers from the grocery store, and glass jars with marshmallows, chocolate chips, and cinnamon. I love this little cottage mix arrangement of flowers! It’s incredible the pretty flowers you can get from the grocery store! They are cheery and brighten up a room on a wintery day! 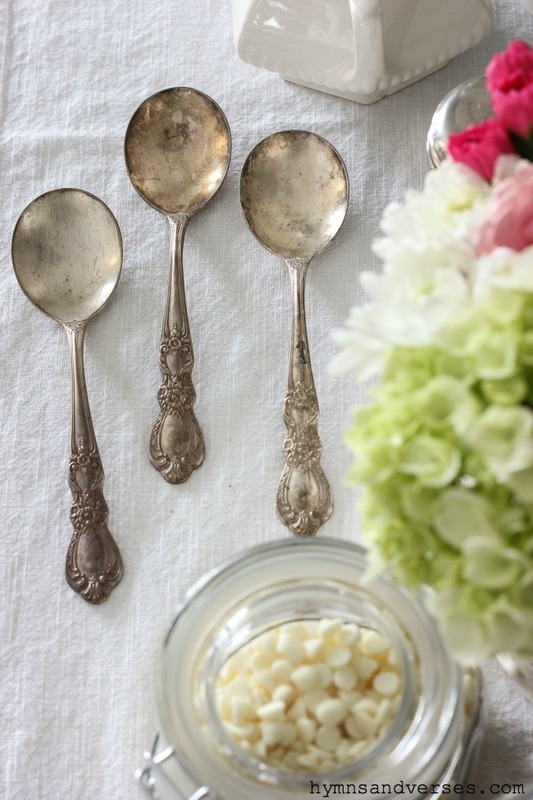 And, I felt these tarnished silver spoons from Goodwill deserved a close up! If you’ve been following me for a while, you may remember that I’ve made a hot cocoa bar with this theme before! It was back in 2014, just after Josh and Sarah got engaged. I used their engagement photos, that were taken in the snow, to incorporate the words of the song. 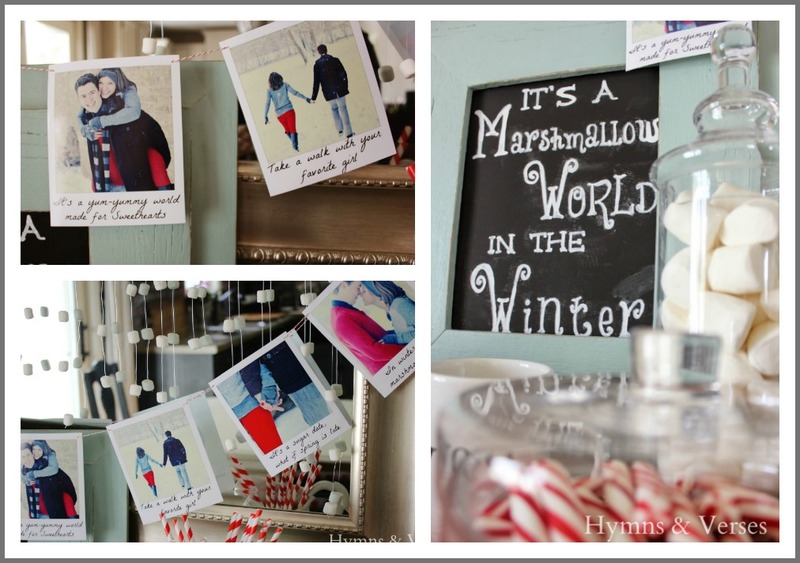 You can see some of the photos from that first “Marshmallow World” hot cocoa bar below! It’s a sugar date, what if spring is late? Stay warm and safe – especially if you live in the midwest! Relax and enjoy the winter weather with a cup of hot cocoa! A wonderfully ‘sweet’ sign. 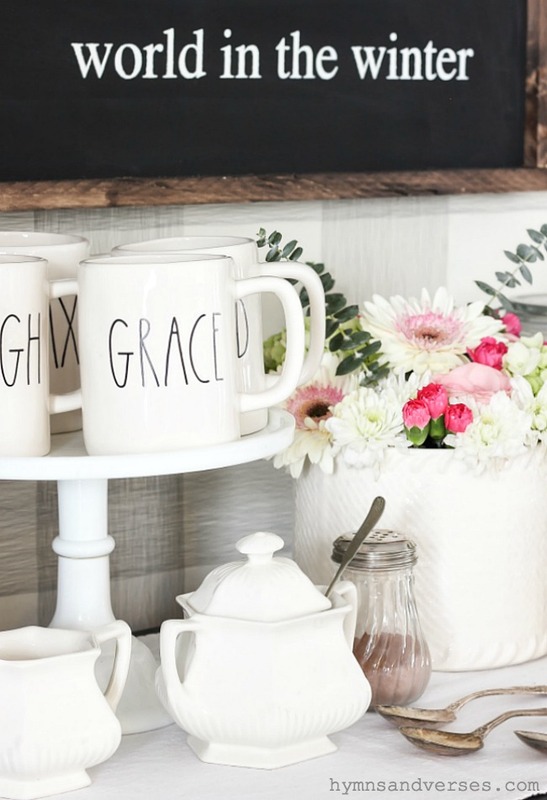 I love your mug, GRACE. I am looking desperately for one. My One Word for 2019 is GRACE. So now I know they are out there somewhere. This is very cute! My kids Love marshmallows! This is adorable. I absolutely love it. Thank you for sharing your creative ideas. I don’t see this sign in your printable library. Are you making it available soon? 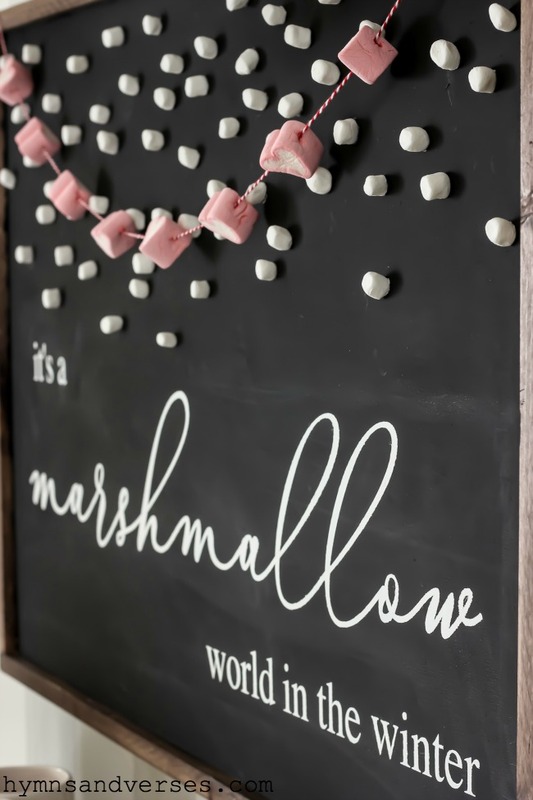 How do you make the lettering on your chalkboard so perfect and neat? Is the sign available to purchase?